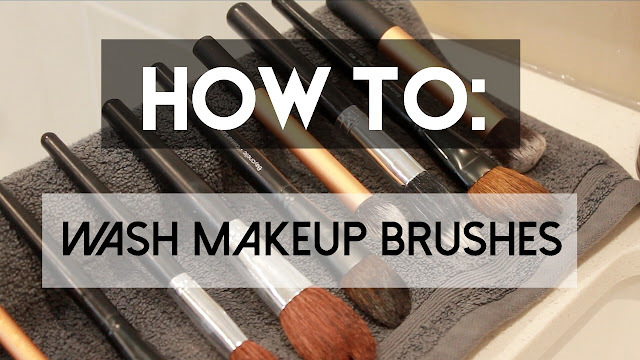 Look at your makeup brushes. Now back to me. Now back to the brushes. Are they dirty, grimy, or even looking a little worse for wear? Never fear, we'll have them looking brand spanking new in no time! I usually like to use a spot cleaner when I'm pressed for time (read: extra lazy) but I typically like to deep clean my brushes like this every couple of weeks. Leaving your makeup brushes dirty for a long time can lead to a build up of bacteria which can cause skin irritations and may even cause a breakout. Even if you don't see this effect on your skin, the excess product builds up in the bristles and hinders them from working properly and can leave you and your makeup in a cakey, streaky mess! Basically, all you have to do is pump some baby shampoo into your hand and while the brush is still dry, work the product in using circular motions. Swirl the brush under some warm water and rinse until the water runs clear and soap free. It's really as simple as that! You can watch the live demo in the video below and I have some tips and tricks that might help you when you get around to washing those brushes! I think the worst thing about having clean makeup brushes is that you don't want to use them and get them dirty again, Ha! Haha! I hate washing my brushes, it's always the worst day! Wow that's interesting and unique. I definitely will try with my brushes! Thank you! Awesome, let me know how you go!